Today, we celebrate Madison’s “Golden Birthday”, she turns “11” on June 11th. We have talked about this day for a while, along with the fact that she is leaving elementary school to go to the middle school in the fall. A lot of “changes” in our lives, most significantly in Madison’s. Madison Lynne came into this world with big beautiful eyes, looking at us so quiet and sweet as though we may have just interrupted a nice little nap. (She was delivered emergency c-section) She was calm and perfect in every way. 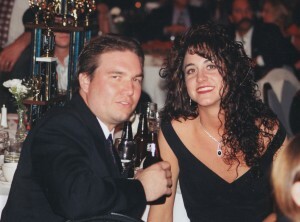 Eleven years later, at 11:59 a.m. we will make her “Golden Day” official!!!! She is still calm, sweet and perfect in every way. Madison is quick to love, shy but friendly, kind and gentle in nature. 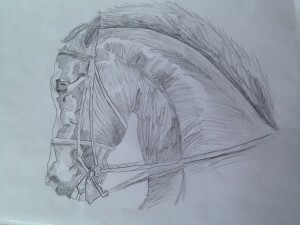 She loves horses, to write, to draw and has a new found love for softball. She is up for a game in the backyard any chance she can. Madison, as you grow, Dad & Mom hope for you that…. 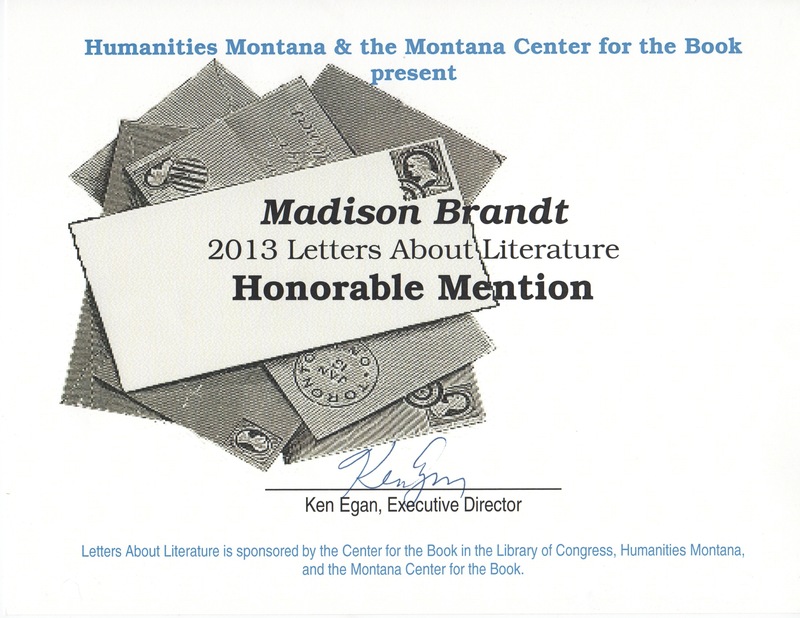 Late last fall, Madison, along with her classmates, submitted an entry into the 2013 Letters About Literature Contest to the Humanities Montana Organization. The contest invites students to write a letter to an author, living or deceased, to express how reading their book impacted them. Madison wrote to Walter Farley, author of the Black Stallion, on how reading his book inspired her to read on about other famous race horses, and how his characters have inspired her not to give up on her dreams. On Tuesday, Madison received a letter in the mail notifying her that out of the 462 letters submitted from Montana, that hers was among 50 chosen by the national judges in the Honorable Mention category. Madison, and one other classmate were recognized for their submissions. As I sat late Tuesday afternoon and listened to her teacher read her letter to her classmates I couldn’t have been prouder. Watching her beam from ear to ear as her classmates congratulated her on her achievements was a moment forever etched in my heart. It has been another amazing year, with an incredible teacher who has tapped into Madison’s creativity. We are watching her blossom, and she continues to inspire us as she steps out of her comfort zone and tries new things while enjoying the things that she loves the most, horses and drawing. The letter from the Humanities Montana said, “We hope that literature will always be an important part of your life.” I hope so too! Congratulations Mady! Mom & Dad are very proud of you! Madison is 10 and an extremely talented artist and writer. (Yes, I realize that I’m prejudice!) She started drawing as soon as she knew what a crayon was, and her creativity has really blossomed. Recently we have discussed in great lengths how to nurture her passion. Do we put her in any art class we can? Take on-line courses? How can we teach her to use the tools and supplies she has to take her gifts to the next level? About a week and a half ago, I had the pleasure of talking to local artist, Treg Miller. I was helping him prepare for a lesson he was giving in first grade at our school. We had a great conversation about Madison, and he really helped me understand that we are giving Madison exactly what she needs. It is reassuring to have Treg’s encouragement, and I feel so blessed that we have such a talented resource for Madison to look up to. Madison loves to draw, and is experimenting with chalk and painting. We spoke to her about sharing her work on my blog, and she gave the go ahead. She is a little shy about the world seeing her art, so we felt this would be a great place to display what she does and I know the positive feedback will boost her confidence. Today’s drawing was done as a gift for her snowboard instructor. Hope you enjoy!